If you've ever shopped for headphones, you've likely come across V-MODA. They make a variety of headphones in different price segments, but I've never reviewed any of them until now. I was offered the chance to review the V-MODA Vibrato headphones ($129.99 USD from Amazon), and since I'd heard good things about V-MODA headphones, I said yes. I'm glad I did, though that conclusion took some time to get to. Confused? Keep reading. You see, when I first got the Vibrato's, I tried all four sizes of the black silicone tips (they also give you a set of clear tips) and settled on the largest size because the fit seemed right. I proceeded to test the Vibrato's over the next two weeks, and was very underwhelmed by their sound - the lows in particular were missing. I did something I rarely do: I checked out what other reviewers said about this product. 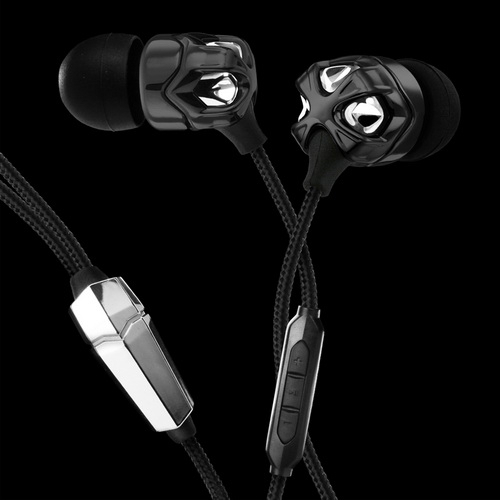 Every review I found was quite positive about the sound quality, especially the bass, so I was puzzled. I went back to the silicone tips and went down by one size...and guess what? I finally got a proper seal and now I see what everyone is raving about! The lesson? Don't assume you have the best fit the first time you try. The dynamic range of the Vibrato's is impressive. This is the part of the review where most reviewers would start to name-drop obscure artists and songs to somehow prove their elite status as audiophiles worthy of gracing you with their opinion. Not here. I listened to the kind of music I enjoy: pop (Kelly Clarkson, Glee), worship (Jeremy Camp, Jesus Culture), rock (John Mayer, Red, Daughtry), orchestral scores (Two Steps From Hell), country (Johnny Cash) and even some rap (Mr. Marshall Mathers is one of the few rap artists I enjoy). Everything sounded great - the high end is crisp, mid-tones well-balanced, and the bottom end is really quite impressive for headphones of this size. Describing audio quality is like trying to describe a colour, but suffice it to say I don't enjoy crappy sounding headphones and I like sound from the Vibrato's a lot. I found they needed some decent volume to really sound good (volume level 20 of 30 on my Zune HD), but that varies depending on your hearing. The gold standard for me are my Ultimate Ears headphones. About five years ago I got my hands on a few different models of Ultimate Ears, and everything I plug in gets compared to those. The V-MODA Vibrato headphones sound better and have fuller bottom end than the Metro.fi 2 ($99), but they should given the price difference. I also compared them to the dual-driver Super.fi 5 EB, and they couldn't quite measure up to the bass - but the EB's were $249 when they were on the market. The point is, the Vibrato's stack up quite well against the competition at the price point. Beyond the strong sound quality, I really like the fact that the cables are wrapped in Kevlar-reinforced fabric - it helps keep them from getting tangled. The 3.5mm connector is plated in 24K gold, and it veers off at a 45 degree angle. I'm sure there's a good reason for it, but it looks cool. There's also a pendant where the two headphone cables meet; it's made of the kind of shiny plastic that will doubtless look terrible after a few months of nicks and scratches, but it helps keep the headphone cables from flying around too much. Here's the really good news: the Vibrato's are perhaps the most comfortable in-ear headphones I've ever used. My much-vaunted Ultimate Ears headphones sound fantastic, but after two hours or so my ears would be quite sore. I've used the Vibrato headphones for four hours straight and there isn't the slightest bit of discomfort. That's incredibly valuable to me. Ditto for the slender carrying case; it's very travel friendly compared to the metal container of my Supfer.fi EB, but offers less protection of course. There are also a pair of ear hooks for people who want to work out while wearing the Vibrato's. I didn't test them because, well, that would require me to work out. Maybe next year. I didn't test these headphones with any Apple products, but for those that have them, there's a hands-free microphone built into a play/pause/volume control pod on the right headphone cable. It's quite small, but useless to anyone not using an iProduct. The bottom line? The V-MODA Vibrato headphones offer impressive sound at a reasonable price - and are incredibly well-designed and comfortable. I recommend them highly. Jason Dunn owns and operates Thoughts Media Inc., a company dedicated to creating the best in online communities. He enjoys photography, mobile devices, blogging, digital media content creation/editing, and pretty much all technology. He lives in Calgary, Alberta, Canada with his lovely wife, his wonderful son Logan, and his sometimes obedient dog. He loves music.